with so many lovely designs saturating the kitchen and bath fixtures market, it's extremely difficult to know how to choose the right product for you without a professional aide by your side. even then, balancing budget and design is a delicate act! when it comes to sinks, asides from knowing your mounting type, it's critical to know basic materials and the differences between them before you make a purchase. the material type can make a huge difference in the product’s longevity, your budget, and the overall style of your project. because it’s cheap and easy to manufacture, ceramic is the most common material for bathroom sinks. these sinks are formed, fired, glazed, and refired. ceramic price points are generally entry level/the lowest you’ll find, but ceramic is relatively brittle and can be prone to cracking and chipping. once a ceramic sink gets damaged, there isn’t an a great option for repair, either. ceramic sinks are commonly used in kid’s baths where some damage is inevitable, or house flips - places where sinking (unintentional but wonderful pun) a large amount of money just doesn’t make a lot of sense. when it comes to durability, look no further than a cast iron sink. made to withstand even the trump administration, cast iron sinks have a beautiful, handmade look to them and aren’t nearly as intimidating as a “cast iron sink” sounds, if you’re put off by the name! though the enamel coating can be chipped and expose the iron to rusting, brands known for their cast iron, specifically kohler, offer a lifelong warranty on their cast iron, meaning they’re guaranteed not to rust/chip/stain/crack - it’s one of the best. cast iron is also resurfaceable, meaning that you can literally have it forever if you give it the proper upkeep and care. additionally, cast iron price points are surprisingly affordable, generally competing with mid-range ceramic options. almost all major sink vendors - blanco, kohler, lg, kitchenaid - all have their own version of egranite. this is a composite material made of an acrylic resin mixed with quartz or granite particles, and is the most durable sink material on the market. it’s heat resistant up to 800°, scratch-proof, dent-proof, stain-proof, rust-proof; virtually indestructible. blanco leads the way with the widest breath of colors, but kohler gets a shout-out for their release of several colors of their neoroc later in 2018, and their material being marginally stronger than the rest of the competition. though it’s one of the most cost-efficient materials available, it doesn’t seem to have caught on with the interior designers yet, nor have I seen it available in bathroom configurations. it’s worth a mention on this list for those exploring materials to use in the kitchen as well, where it is a beast! fireclay is almost identical to ceramic in manufacture, but supremely durable to many materials, especially ceramic. fireclay itself is a pure clay mixed with minerals and enamel powder for strength, and is fired at a higher temperature than ceramic. unlike “standard” ceramic, it is nonporous. you’ll pay a bit more for it, but you’ll have a hard time (the puns just keep coming) chipping or breaking a fireclay sink. the third type of ceramic: china. 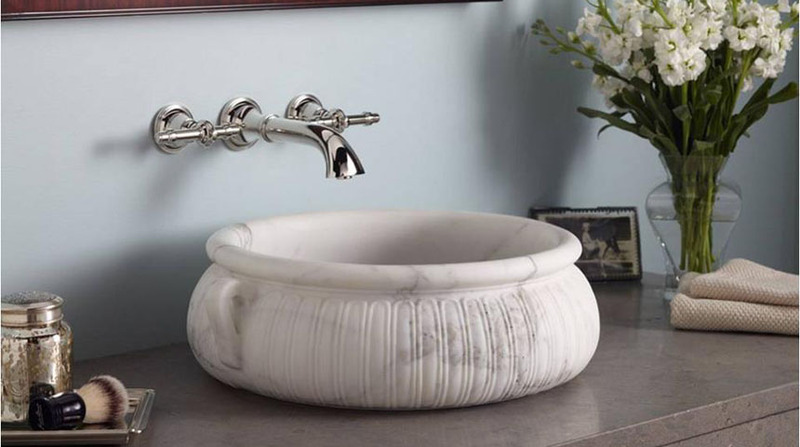 china sinks are made of the pure clay used in fireclay sinks, but are fired at a higher temperature and use a finer gloss for a smoother and more consistent overall finish. 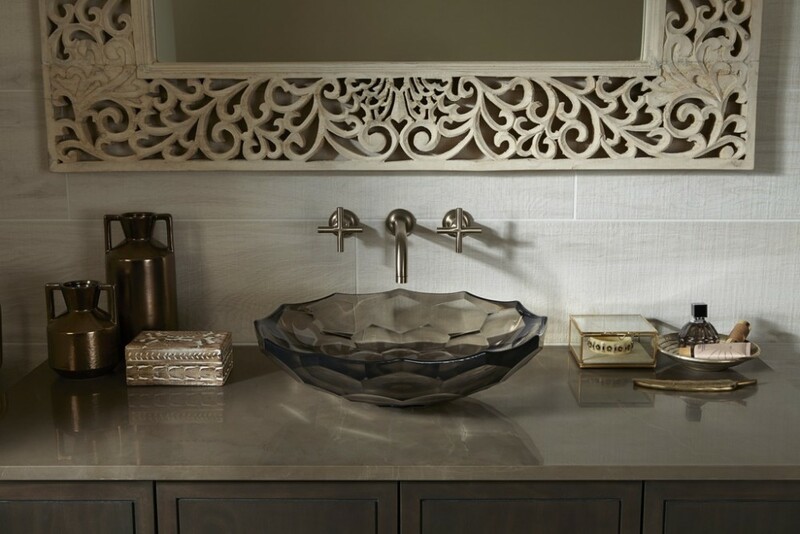 the finished sinks are generally thinner than regular ceramic sinks to allow for fine sculptural detail and decorative artisan prints. like your fine dining set, designer sinks adorned in gold and platinum details are more than likely made of vitreous china. don’t be offset by the “china” title, however; you’ll find that these are actually more durable than ceramic, without the fireclay price point. generally reserved for powder rooms or baths that get minimal to light usage, glass sinks are stunning, albeit difficult to upkeep. glass can be colored either through-body, or have a glazed underside, which makes cleaning a bit easier. quality glass sinks are made with durability in mind, so you needn’t be worried about the breakage with medium usage (ceramic is more prone to break, to be honest), but they are pricier and may be a bit harder to work into a design. if you can front those two aspects, there is no more stunning sink material, in our opinion. stone sinks are show-stopping, let'ssss be honest. they are, however, not for the faint of heart. at the very top of the price point across almost all brands, a genuine or artisan stone sink won’t come cheap, nor will it be an easy find. with the exception of shower walls, backsplashes or light-traffic floors, it’s an extreme rarity that I recommend natural stone in wet locations, but nothing truly matches the beauty of real stone. as with any stone that will regularly be exposed to water, especially submerged, in this case, the sink will need to be sealed on a regular basis or it will stain - and that’s just from the water. if you are planning to use the sink regularly and can foresee it fronting the toothpaste stains, mouthwash, etc, I would steer clear of such a fragile and high-maintenance material, instead opting for something more practical. 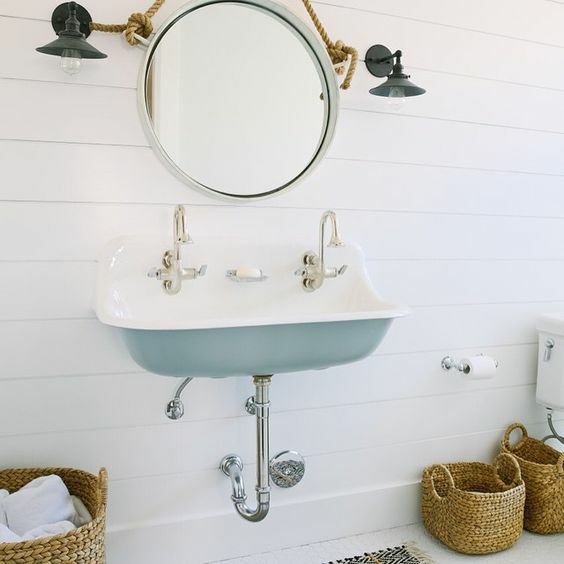 a light use powder room would be ideal for this particular material! there are so many different materials, price points, designs, brands and styles to consider, and when you're doing an entire remodel, choosing a sink material, let alone a sink seems so minute. ultimately, it won't make or break you, but it's certainly handy to know. what have you found your favorite materials to be working in homes? is there one type or brand that you’ve had particular success with? really curious to hear on this one! !